Are tax rates likely to go up, down, or stay the same in the future? For most people approaching retirement, they're not bothered by that question as many believe they will be in a lower tax bracket regardless (due to working less in their retirement years). However, the amount of taxes you'll be paying for in retirement may be significant and can ultimately deplete your savings a whole lot faster than you ever imagined. 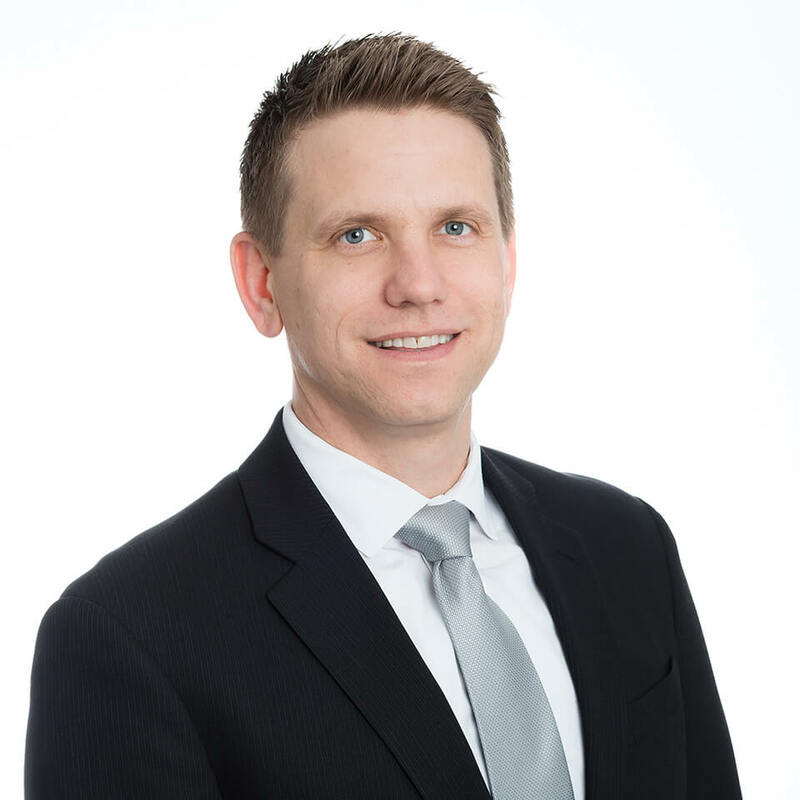 In this episode of Money Script Monday, Kevin demonstrates the reasons why taxes should be regarded as a MAJOR factor when planning for retirement. Hi there. My name is Kevin Nuber, and thank you so much for watching today's Money Script Monday video called, "The Impact of Taxes in Retirement." I've been fortunate enough to ask these questions to thousands of different potential clients, and that is this, what do you think taxes are going to be like in the future? Do you think taxes are going to go up, stay the same, or go down? And before I can finish the question, people started yelling out, "Taxes are going to go up. Taxes are going to go up." And an overwhelming majority of the people believe that taxes are going to go up in the future. If I ask then the same group of people the second question, which is, what do you think taxes are like today? Are taxes high? Are they average? Or are they low? And again, everybody says that taxes are as bad as they've ever been. They're so high, they're outrageous. But the truth is, is that today, taxes are about as low as they've ever been. There's only one period of time in the past, in the 1980s, where taxes were lower than they were today, and it's just by a few percentage points. So, the truth is, is taxes today are about as good as they're ever going to be. 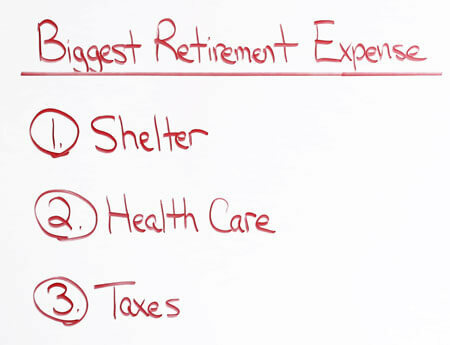 What I would like to say to you is that planning for taxes in retirement needs to be one of your primary focuses. Now, most people might say that's ridiculous. I've always been told that the number one thing that I need to plan for retirement risk-wise is market risk. So, why do people think that? From the moment that you wake up in the morning, to the time that you go to bed at night, you're being bombarded by the Wall Street marketing machine telling you that if you just have a perfectly balanced portfolio with the right Wall Street investments, that earn you a high rate of return, then all of your retirement problems are going to be solved. You wake up in the morning, you go to the gym, there's Mad Money Cramer on TV telling you about the hottest stock pick to choose and the latest IPO. You get in the car, you drive to work and Dave Ramsey and Ric Edelman are on the radio, telling you about the perfect five-star mutual fund that's going to earn you a 12% rate of return or higher. And then you get home at night and Suze Orman is on TV telling you that Wall Street products are the best, everything else is bad and to put all your money into a 401(k). So, we've been told for our entire lives that this is the number one risk. But the truth is, is that taxes might be your number one risk in retirement, and at least might be a close second. If I go to the same group of people and I ask them what do they think the biggest retirement expense that they're going to have the day that they retire and after? Do they think it's going to be shelter in the form of a mortgage payment or rent? Do they think it's going to be healthcare? Or do they think it's going to be taxes? Almost everybody is going to say that healthcare is going to be their number one expense. And think about it, for the last 15 years, we've heard news stories and things in the media about how outrageous healthcare expenses are, and how they're increasing at these astronomical rates. While that's certainly true, they're definitely going up. The truth is, is that for some people, and that is top income earners, the number one expense that they're going to have in retirement is going to be taxes. A recent survey and study of thousands of people across the country showed that for people to make $100,000 to $150,000 per year in income, is that their taxes are going to be $17,000. That's a significant amount of money. 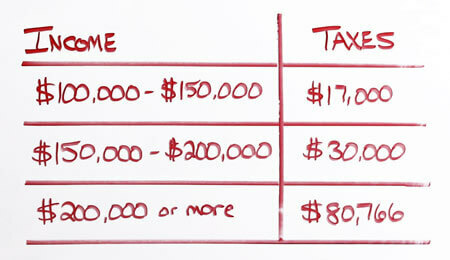 If you have $150,000 to $200,000 of income, your taxes per year are going to be $30,000. If you make $200,000 or more, your taxes are going to be $80,000. You can see how this problem gets bigger the more money you make. The truth is a majority of people don't make $100,000 of income. So for people who are not high income earners, then it is true healthcare is going to be your biggest retirement expense. A recent study that was commissioned by Fidelity last year concluded that the average married couple age 65, that their expected health insurance and health-related expenses in retirement would be $280,000. But it is also true that the average length of retirement for that same couple is 27 years. This comes out to almost $10,000 a year in the form of healthcare expenses. While this is a lot of money, $10,000 per year, this is nothing compared to the amount of taxes that you're going to be paying in retirement. So, what I would say is that if you're in this top income category, then perhaps planning for taxes should be one of your number one priorities. But I know what you're thinking, you're thinking I've always been told that taxes are going to be lower when I retire. But let's just, for the benefit of the doubt, let's just say that the taxes stay the same, that they're never going to change as far as tax rates and that when you retire, you know, your taxes are going to be lower because that's just how it works. You have less income and you're going to pay less taxes. What I say to you is that that was once true, but today, things have changed because tax law has changed. If we look at the biggest tax deductions that people have today, while they're still working, the number one deduction that people have is their mortgage interest deduction. Now, if you listen to the same talking heads and things in the radio and the media, they're always going to tell you to pay your home off before you retire, or at least have it mostly paid off. And if that's true, your number one deduction today is eliminated. Furthermore, the second deduction that you have is your 401(k) contribution. While you're not going to be making 401(k) contributions when you retire because you have no job and you have no account 40(k) to contribute to, so that's gone. And then lastly, the child tax credit. Hopefully when you retire, your children are no longer dependent and you're not claiming child tax credits. And if that's true, that means that all of these sum total, this could be $20,000, $30,000 of tax deductions that you have while you're working that are completely gone the day that you retire. This is how you can actually have a lower amount of income in retirement and still pay a higher tax rate because your tax deductions have been eliminated. 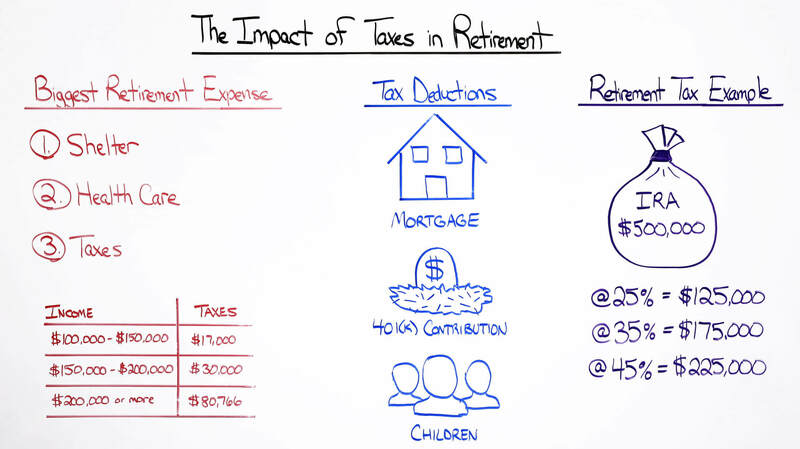 So, what kind of effect do taxes have...what are they going to have on your retirement portfolio? Well, if you listen to all those same media outlets, and radio, and TV personalities, they're all going to tell you that the best place to put your money is in your 401(k). Every year, your CPA is going to tell you to do the same thing, to maximize your 401(k) contributions. And if you do that, you might end up with $500,000 in your IRA. 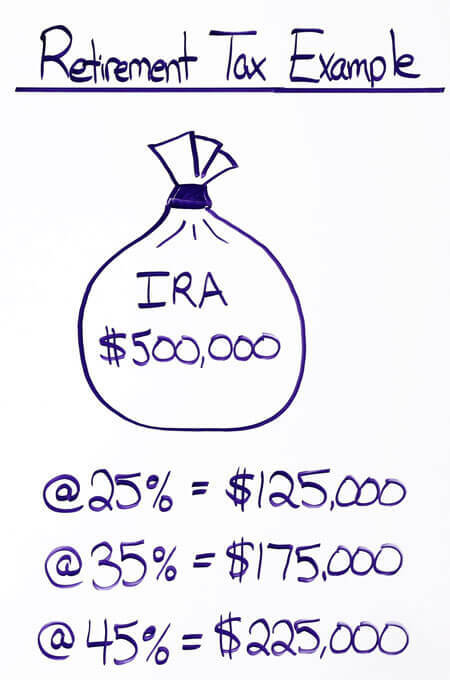 If you have a 25% effective tax rate, then that means $125,000 of that IRA balance is not yours. That is owed to the IRS. And if taxes go up in the future, let's say a 35%, now you owe $175,000. And if taxes go up to 45%, now it's going to go up to $225,000 that you're going to owe to the IRS. This would have a substantial impact on the success that you're going to have in retirement. I started off this video asking the question, do you think taxes are going to go up in the future or should go down? And almost everybody is going to always say they're going to go up. I pointed out that taxes are as low as they've ever been in the future. With that being said, and now the realization that taxes, if you're in a top income earning category, is your biggest retirement expense, then perhaps you should do some proactive planning today to put your money into tax-preferred or tax-free type of products or investments so that on the day that you retire that you insulate yourself from those potential future income tax increases. Thank you very much for watching.